The Center for the History of Psychology receives hundreds of reference requests each year via telephone, email and on-site visitors. So who is conducting research at CHP? You’d be surprised to learn that it isn’t just historians of psychology. Our patrons are a diverse group researching a variety of topics including my own personal favorite – family history. Recently we received an email from George Rosenberg in London. Rosenberg came across the Center through a reference to an oral history in King and Wertheimer’s (2005) Max Wertheimer & Gestalt theory. The oral history was conducted by Michael Wertheimer and the interviewee was Anni (Wertheimer) Hornbostel – Michael’s mother and Max Wertheimer’s wife. It turns out that George’s great uncle, Fritz Rosenberg, was married to Anni Hornbostel’s aunt Emilie Pick! Even cooler – Anni met Max Wertheimer while living with the Rosenbergs and attending the University of Berlin. And as newlyweds Max and Anni lived in a small apartment in Berlin owned by Fritz Rosenberg. Tragically, George informed us that in 1941 the Rosenbergs committed suicide in order to avoid “deportation” and he is currently working on tracking down information about them. We were happy to send a copy of the oral history to Mr. Rosenberg. Another family oriented request came from a patron searching for materials regarding her grandfather, social psychologist Aaron Hershkowitz. Tara Gould found the Center through a reference to Dr. Hershowitz in the Solomon Asch finding aid which is available to researchers through the OhioLINK Finding Aid Repository. We were able to locate several letters between Asch and Hershkowitz and several references within two other manuscript collections. We sent the scanned materials to Tara via email (click on images below to enlarge). She hopes to use the them in a film project about her grandfather. The Center also regularly works with other archives and libraries, sharing information whenever possible. 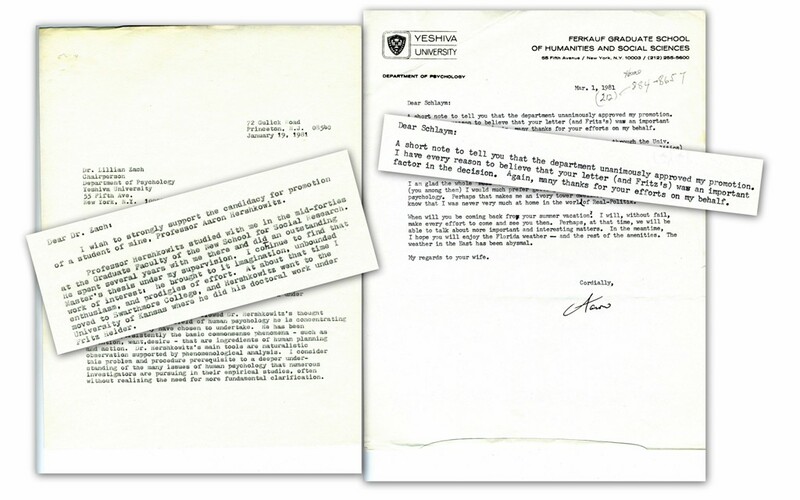 We recently received a request from a fellow archivist at the Hanns Sachs Library and Archives which is located at the Boston Psychoanalytic Society and Institute. The archivist was processing the papers of psychoanalyst Felix Deutsch. In processing his papers, the staff came across a handwritten letter to Deutsch that appeared to be from Abraham Maslow. However, the authenticity of the letter was in question. Upon doing some searching online, the archivist found that the Center has a large collection of materials from Abraham Maslow in our manuscript collection. She e-mailed us to ask if we could scan and send her some handwritten documents by Maslow so that they could authenticate the letter. We scanned and e-mailed her two such documents from the Maslow papers. 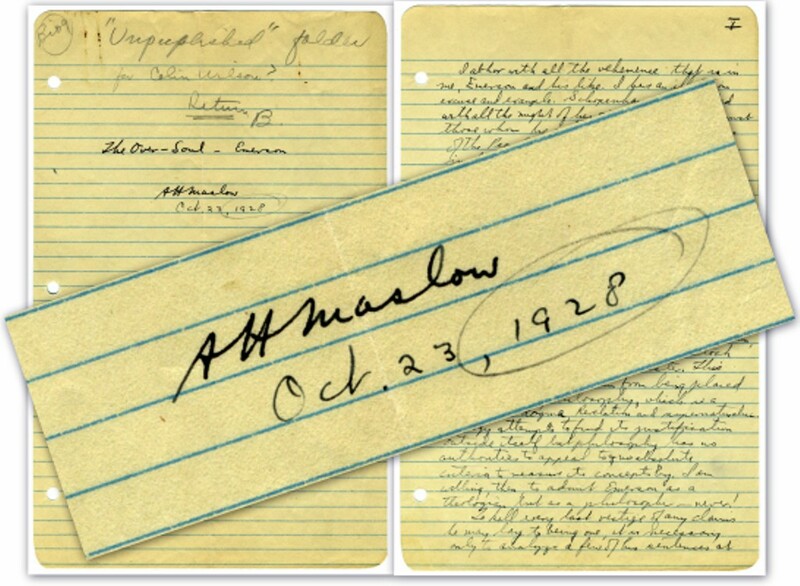 One was a letter to his daughter signed “Dad,” and the other was a paper titled “The Oversold Emerson” which was signed “AH Maslow.” The archivist replied promptly saying that the documents we sent were sufficient proof that the letter to Deutsch was in fact written by Abraham Maslow. These are just a few examples of the stories told and mysteries solved here at the Center every day. Stay tuned to the CHP blog and facebook page for more of these tales from the Archives! Lizette Royer Barton is the Reference Archivist at the Center for the History of Psychology. She handles all requests for research assistance. Andrew Tannehill is a graduate student in the School of Library and Information Science at Kent State University. We are happy to have him completing a practicum here at the CHP.